The Art Deco style and its influences from Charles Rennie Mackintosh to Josef Hoffmann, Clarice Cliff and Le Corbusier. Art Deco is characterised by highly stylised natural and geometric forms and ornaments, which are usually strongly symmetrical. Outstanding American examples of Art Deco are the Chrysler Building and Radio City Music Hall in New York City. Some of the century’s most significant artists, such as Pablo Picasso, Fernand Leger, Sonia Delaunay and Wassily Kandinsky, produced work in the art deco style, as did many designers of furnishings, textiles, jewellery, and advertising. 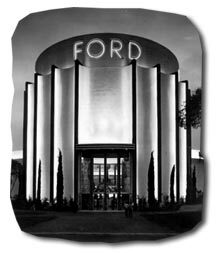 In Balboa Park, the Ford Building (now the Aerospace Museum) exemplifies industrial art deco design. The tall circular tower is clad in blue fins separating giant gear teeth. An allusion to a cogwheel and a reference to the advancement of humankind through mechanization. Architect Walter Teague designed the building as an “Expo Plant” for the 1935 California Pacific International Exposition. Art Deco themes were often classical motifs reduced to geometric stylisations. Edgar Brandt decorated wrought-iron screens with symmetrical fountains; Emil Ruhlman inlaid ebony cabinets with ivory to depict floral arrangements of geometrical precision; René Lalique etched scenes, such as a graceful striding female with a wolfhound or gazelle, into crystal or frosted glass; and Jean Puiforcat and Daum depicted abstract geometric forms. The term art deco, was coined in the 1960s when interest in the style revived, and was derived from L’Exposition Internationale des Arts Décoratifs et Industriels Modernes. The International Style in architecture developed at the same time, and after 1925 it considerably influenced the final phase of art deco. Along with cubist painting and the German Bauhaus school, the work of Le Corbusier and other International Style architects effected a change from the earlier, more decorative phase of Art Deco toward a simpler, bolder approach typical of the 1930s. Art Deco emerged as a reaction to Art Nouveau. The two forerunners of the art deco style were Charles Rennie Mackintosh of Scotland and Josef Hoffmann of Vienna. Both men were reformers of the excesses of the art nouveau style, and their works around 1900 were an indication of what was to appear in the next few decades. Hoffman’s austere Palais Stoclet in Brussels (1905-11), with its mosaic murals by Gustav Klimt, was surprisingly advanced for its time, and it marked the transition from art nouveau to art deco. In 1903, Hoffman founded the Wiener Werkstatte, a workshop that produced some of the earliest art deco designs. In 1910, these concepts were introduced in Paris at a louvre exhibition of decorative arts from Munich and Vienna. On display was a new style based on a simplification of the early 19th-century neoclassicalbiedermeier style and of peasant art, or folk art, which was almost the antithesis of art nouveau. Another significant event took place in Paris in 1910; the presentation by the Ballets Russes de Serge Diaghilev of Scheherazade. Leon Bakst had concocted oriental sets and costumes in dazzling, barbaric colors; this brought a demand from the fashion world for exoticism, that was answered by the couturier Paul Poiret. In 1912, Poiret created his own design school, the Atelier Martine, to expand his art deco ideas. By the 1920s, the effects of art deco style cubist painting were seen in advertising and product designs. Coco Chanel used cubist colors and forms in creating women’s fashions, which she dressed with art deco jewelry. African sculpture and ancient Egyptian and Southwest American Indian arts all had their influence on art deco in this decade, as did archaic Greek art. After 1925, the influence of Bauhaus and the international style, took art deco to a final stage of development that reflected the industrial age. Achieving a reconciliation of the arts and machine production that had troubled artists and designers since the Industrial Revolution began. 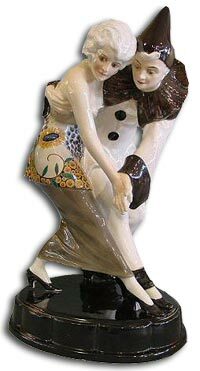 Art Deco Collectables are among the most sought after of all 20th Century designs. Not just for there beauty but also for the exquisite quality of the pieces.